Aileen and I have known each other a long time. We’ve shared a lot of meals in a couple of cities spanning two decades or so, and though she’s not in Philly anymore, it’s kind of like she still is. Reading the weekly entries on 25×52 connects me to a community that I love and treasured being a part of, so I am super excited and honored to be contributing this week. Reading about the plethora of Shabbat options in Philly each week sometimes makes me homesick (and jealous! ), but also inspires us to find new ways to create a Shabbat community here. Ithaca, New York is a relatively small college town of 30,000, but with two synagogues and a thriving Jewish campus life at Cornell and Ithaca College, we are slowly finding our niche. We took advantage of a week when Brian did not have to work on campus and we would not be eating at 104West (CU Kosher Dining Hall). I spent Thursday night combing through cookbooks and magazines, determined to live up to the expectations that the Philly-gang set forth. On Friday I started with the soup, making good use of an immersion blender. Step two was slicing potatoes for the top of a casserole, and I decided to use our mandolin slicer, which had remained in the box since our wedding. Half a potato into the task, my hand slipped, causing a trip to the ER. [Miriam’s note: my mouth just fell open. Holy cow! Cooking adventures! So glad it wasn’t more serious!] I returned home less than two hours later, with no stitches, but a very heavily bandaged thumb, creating some interesting challenges in producing the rest of the meal. Jocelyn and her friend Josh showed up first with Wine and Raspberry Lambic (I was a bad host and saved the Lambic for later), and we started our meal with a snack of sliced (by Brian!) Pears and Brie, while we waited for our friends Jessica and Ian. We typically buy our challah from the Challah for Hunger group on campus, which raises money for AJWS, and this week we added to that a challah given to Brian by a co-worker. Our first course was a Butternut Squash Soup, seasoned with cinnamon and nutmeg. Our main course was a Sweet and Sour Bean Casserole, Baked Sesame Tofu, and a Field Green Salad with Beets and Polenta Croutons. The croutons were the hit of the evening and I cannot wait to make them again just for a snack. I had planned to bake a pear tart, but instead I bought an Apple Pie at Ithaca Bakery on the way home from the ER, served with a Fruit Salad from Jessica. Shabbat morning is the one day that neither of us have to be out of the house before 8:30, so we tend to sleep in, rather than rush to services. Since we will cook on Shabbat, it is also a wonderful opportunity to have a real breakfast, my favorite food. With nineteen fingers working together, we made a great Shabbat brunch for two of Greek Yogurt Pancakes with a Raspberry Sauce and a Spinach Parmesan Omelet. Shabbat afternoon we walked to Rabbi Glass’s house for Tea and Talmud. It was the first time we had attended the bi-weekly study sessions and we’ll probably go back again. We then headed up the hill to Cornell for Clock Tower Havdallah, a joint service sponsored by the Jewish student groups. Almost 40 students gathered at the base of the McGraw Tower for havdallah, followed by an impromptu Purim song session. Then many of the students climbed the 161 steps to the top of the clock tower for a first-hand look at the chimes in the tower and a concert. The Chimester on duty that night entertained anyone within earshot of the tower with a “Best of Jewish Music,” including Hava Negillah and Hinei Ma Tov. It was a fun and uniquely Ithaca way to end Shabbat. I hope that we will be able to take the inspiration we found this week to create a restful and meaningful 25 hours of Shabbat and bring it to every week. We are two Jewish professionals, relatively plugged into the Jewish community here in Ithaca, and if we find it challenging to find a Shabbat niche, it makes me think about fellow Jews in smaller communities or people who move somewhere new with fewer automatic connections. The Shabbat culture that Miriam, Grad Network, Minyan Tikvah, Heymish, and others have created in the Center City community is a great gift to both long-time residents and newcomers to Philly. [Miriam’s note: awww] We cannot wait to read what you eat next week! 1) Preheat oven to 400. Thinly slice the potatoes and par-boil them for 4 minuts. Drain the potatoes thoroughly. Toss them in oil so they are lightly coated and set aside. 2) Place the butter, flour, tomato sauce, apple juice, sugar, ketchup, sherry, vinegar, and soy sauce in a saucepan. Heat gently, whisking constantly until the sauce comes to a boil and thickens. Simmer gently for 3 minutes. Keep warm. 3) Rinse and drain the beans and add to the sauce with remaining ingredients. 4) Spoon mixture into a casserole dish. 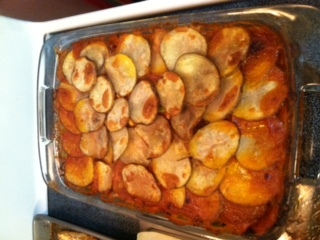 5) Arrange the potato slices over the top of the dish, overlapping them slightly and completely covering the mixture. 6) Cover the casserole with foil and bake for about 1 hour, until the potatoes are tender. Remove foil for the last 20 minutes of cooking time to lightly brown the potatoes.